Green building trends, and environmentally conscious living, are growing in momentum all across the United States, and included in that movement is the city of Boston, where a first of its kind green residential development recently opened to the public. The Macallen Building in northern South Boston opened to residents in June of 2007 (see related event information on the Boston Condo Blog) as the first gold-level Leadership in Energy and Environmental Design (LEED) certified condo development in the Massachusetts capital. The new condo development is nestled among hip, and up and coming, Boston condo developments in an area less than a ten minute walk from the core of downtown Boston, and is immediately accessible via the Boston subway, called the “T”. 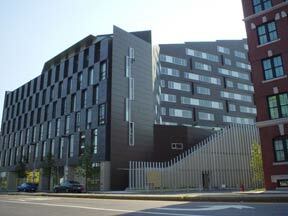 The Macallen Building strived hard to achieve the highest LEED green certification level. Due in part to its green roof, the Macallen will save over 600,000 gallons of water each year, and its systems allow for annual electric savings of approximately 30% compared to similarly sized buildings. One of the most striking features of the Macallen Building is its sloping 6 to 12 story green roof, which is set with sedum, a flowering plant that will change colors with the seasons collecting rainwater runoff for landscaping use. The entire building is non-smoking, and unique to Macallen is heating and air conditioning systems in each unit that pull fresh air, not re-circulated air, from the outside directly into your unit to maintain the best indoor air quality, while insulation comes from recycled jeans. The development team, Pappas Enterprises, went so far as to come up with a Green Manifesto. The Macallen Building at 141 Dorchester Avenue in South Boston has set the gold standard in Green construction for Boston real estate, and it will be up to those following the Macallen to keep pace with the high standards that have now been set for future city of Boston condo developments.